Strong and weak nuclear forces, and electromagnetism and gravity are acknowledged as the four fundamental properties of ordinary matter. To this list, I propose to add spin as another property of matter and one that is essential for explaining many phenomena in the universe. By simply assigning to this universally observed property a function, one can describe how order is obtained in the universe. Isaac Newton's universal gravitation was used for over three centuries to explain planetary motion. A major weakness of this theory, however, was that it did not explain why such universally attractive force does not lead to all bodies crashing into one another and thus leading to chaos and total breakdown of order in the universe. Scientists have used his 1st law of motion to explain the outward motion, while the gravity exerts a constant inward pull. However, who started this motion in the first place or the persistance of this motion for the billions of years are difficult to explain by this mechanism. Such motions will continue 'forever', only if the space is free of even the slightest friction. Clearly, the gravitational pull from the various bodies in space will act like brakes and eventually bring all motions to a stop. Einstein attempted to fix this problem by proposing a force that operated to counter this universal attraction, and he christened it 'cosmological constant'. In 1929, Edwin Hubble observed that light from distant galaxies were more red-shifted, the farther away they were from the observer. From this he deduced that all galaxies were flying away from one another at high speeds and, astronomers who followed him have proposed that the space of the universe itself was expanding and carrying all bodies with it. By extrapolating backwards in time, Hubble proposed that the universe started from a mere point in a huge fireball called the "Big Bang", purportedly some 14 billion years ago and ever since the space itself has been continuously made de novo. This unbelievably amateurish idea has ever since held center stage in astronomy. It even had the blessing of Einstein, who, upon hearing about it, declared that 'cosmological constant' was his biggest blunder and, promptly he changed his equations to include this 'expanding universe' theory! Stephen Hawkins characterized what Einstein did in this fiasco as 'fudging the equations". Proofs offered by scientists who followed Hubble, for this expanding universe were two-fold: First, when light from distant galaxies were analyzed for red shift, the farther the galaxies were, the more red- shifted they were. The inference here was that those distant galaxies were flying away from the observer at higher speeds than the nearer ones. The second was the identification of a uniform "Cosmic Microwave Background Radiation" (CMBR) in every direction that the observers probed, with their earthbound instruments. The scientists proposed that this radiation was the remnant of that long ago explosion. The former observation itself demanded explanation: how could the space be made anew and expand for ever, ever faster, ad infinitum? Well, if one were to believe the students of astronomy of today, the fix is to invoke strange new properties to matter, such as 'dark energy', 'negative energy' etc. This is the state of the art in current cosmology; these highly conjectural ideas have even revived the old Einstein creation, 'cosmological constant'. However, like trying to fit a square peg into a round hole, with the current explanations, the scientists are not able to make definitive conclusions. I question the second observation, the one about CMBR, as well. It looks to me absurd to extrapolate to the whole vast universe, the finding of a uniform level of any form of radiation, here on earth. We all know the earth is but a small planet orbiting a mediocre star in the outskirts of the vast Milky Way galaxy, which itself is but a regular-sized galaxy among hundreds of billions of galaxies in the infinitely vast universe. Calculations made from this observation and then extrapolating them to what happened billionths of a second after the "Big Bang" (this is what scientists have done) or generating computer-models of a purported view of the distribution of energy in the infant universe is equally ridiculous. I even question that red shift of light from far away objects such as galaxies necessarily means a trajectory and acceleration in a straight line. Perhaps this feeble type of measurement is inadequate to determine the speed at which such very distant objects travel. Or, if one applies the universal property of spin, one can assert that it really measures faster orbits of the farther objects that orbit the axis of the universe. This is quite analogous to what happens in the spiral galaxies. Scientists have been puzzled by the velocity at which stars that are at the periphery of the spiral galaxies have been observed to travel. Common sense dictates that, given the longer distances they have to travel, the farther out the stars are from the center of the galaxy, longer they will take to clear the space. However, that is not what they observed; the peripheral stars seemed to go faster and keep up with the stars located nearer the center. Scientists have proposed that the 'dark matter' that comprise at least 90% of the matter in galaxies is responsible for this phenomenon. Perhaps the galaxies that are orbiting the periphery of the universe are also orbiting at ever faster speeds than the ones that are closer, and for the very same reason as in the case of the galaxies, again due to the ~ 90% of dark matter. Einstein introduced the notion that spacetime is a single entity and its fabric itself 'warps' around large bodies (such as the stars and planets). He taught that this spacetime warping is why the satellites are situated where they are. However, this notion cannot explain why the satellite bodies orbit the mother body, rather than just remain at a location, depending on the degree of 'warping' that occurs. I question even Einstein's contention that gravity can warp space itself. On the other hand, it is entirely feasible that gravity grabs any matter that is in the vicinity of the body that wields the force. Newtonian universal gravity, Hubble's Big Bang and the expanding Universe and Einstein's teachings completely ignore the fact that all stars, planets and lesser bodies in the Universe rotate on their own axes as well as orbit the nearby larger body that wields the commanding presence. The inverse square law explains perfectly how one could predict the velocity at which planets will orbit the parent star, if the distance of the planet to the star is known. This law states that the influence from the dominant body (usually a star) diminishes directly proportional to the distance from that body. 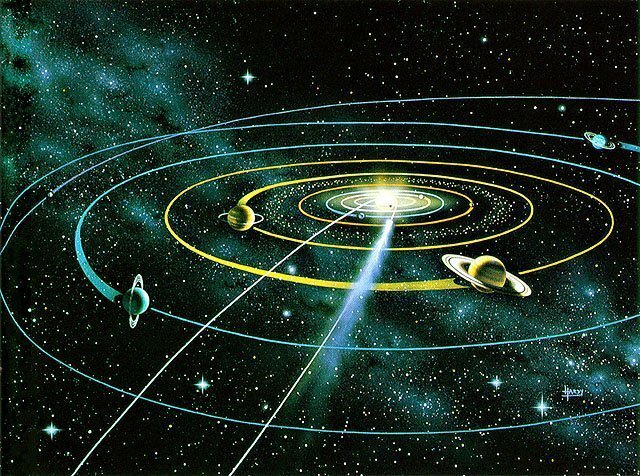 As the planets orbit the star in one direction, which is the same direction as the rotation of the star on its axis, and at the predicted velocity, the clear inference is that the central star is actually also moving the satellite planets with it. Everyone acknowledges that one force that effects this exquisite order in the solar system, is the mutual pull called gravity. But, gravity alone cannot explain the whole phenomenon of orbital movement of the satellites (or, indeed the rotation of all the celestial bodies on their own axes). That force is something one has to infer; this is the influence the mother body (sun/star) wields on the satellites through its rotation on its own axis and making use of a well-known physical law called the centrifugal force. The inward pull of gravity is perfectly counter-balanced by the centrifugal force that obtains when the satellites are moved around by the combination of gravity and the mother body's axial rotation, and keeps all the satellites at their proper places and in their orbits in the solar system. This is roughly analogous to a ball tethered to the end of a rope and spun around by an observer; the rope here is the gravity and the flight of the ball around in a circle is the centrifugal force. Further, the rotation on its axis imparts to the star the most gravitational pull at the equatorial plane; this explains why all the satellite bodies end up at or close to this plane (the 'ecliptic'). Other examples of this phenomenon are the disk of dust and proto-planets that form at the equatorial plane of a proto-star and the rings that are found orbiting Saturn, Neptune and Uranus. To offer the above explanation does not require concocting esoteric, unproven and perhaps un-provable properties such as 'negative energy', 'dark energy' etc. The rotation of bodies on their own axes is a universally observed property of all planets and their satellites (when they have any), the stars themselves and the vast majority of the galaxies, around their own center. Indeed, huge galaxies such as our milky way and its larger neighbor, the Andromeda galaxy rotate as a whole around the center of the respective galaxy. The Milky Way galaxy takes 25 million years to complete one rotation around its axis. Current cosmology categorically states that these and all other spiral galaxies spin on their axes by the action of that figment of mathematical imagination, 'super-massive black holes' at their centers. These curious monsters that astronomers and astrophysicists now invoke for many and varied inexplicable phenomena in the universe, cannot be seen or even experienced. The scientists simply have the problem of explaining how these huge structures (the galaxies) rotate on their axes and invoke these astronomically massive yet invisible structures (the "Black holes") with unbelievable power. And they completely ignore the very visible large structure at the center of such galaxies, the size of several billions of ordinary stars! I will propose that this structure is really a conglomeration of billions of stars that have crashed into one another at the time of the formation of the galaxy and then became one gigantic fireball, with all the properties of stars, albeit, at a proportionally larger scale (I christen this structure "Galaxstar"). It is so gigantic that, by rotating on its own axis, it is able to generate such gravitational pull (at its equatorial plane, I might add) that it is able to drag all the components of the galaxy around it. This simplistic idea based on real observations does not need invoking unknown special properties of matter or some imaginary beasts at the center of the galaxies, with convenient incredible properties. While they make all these wild assumptions, just like ignoring the observation of the spin of proto-stars and stars as being of no consequence (but which, I beg to give fundamental importance to explain where the satellite bodies end up and orbit), and simply explain it away as "conserving angular momentum" (whatever that was)! The exquisite and incredibly stable rings of Saturn are also situated in a narrow band-like region around the equator of the planet; the rings dutifully orbit the mother in the same direction as its (Saturn's) axial rotation. As explained in the article given at a later section in this website and captioned "Assigning a role for spin (rotation) in the make-up and function of matter in the universe", the closer satellites of both Jupiter and Saturn even orbit synchronously with the mother planet (this means the satellite orbits the mother and spins on its own axis in the same time period). This is exactly like someone spinning a ball at the end of a (short) tether; in the case of the planet and the closer satellites, the tether is the strong and unimpeded gravitational pull from the mother. The shape assumed by planets hint at the effect of the spin on the body itself; at the equatorial plane, each planet is slightly wider than a sphere might be. This, I suggest is due to the shearing force imparted on the body by its own spin on its axis. This phenomenon can be used to describe what happens in all stars as well; once they have ignited, the force that helps counter-balance the intense inward pull of gravity is this centrifugal force imparted by the axial rotation. The conventional astronomy attempts to explain the spherical appearance of stars as being due to the balance between gravitational pull and the outward force imparted by the explosions of the fusion reaction. However, the balancing effect of the spin more elegantly explains why the stars attain the almost spherical shape, rather than an irregular lumpy-bumpy appearance that the effect of explosions might impart. Also, with this explanation one will not need to invoke the appearance of 'black holes' at th end of the life of the star, as conventional cosmology contends. Further, since all planets also attain a roughly spherical shape, but they have not ignited, the current cosmological assertion of gravity being counter-balanced by the nuclear fusion reactons, does not sound credible. I must end this section with my favorite ally in my hypothesis that spin is a fundamental and essential property of matter: the neutron star. The neutron stars are remnants of large stars that have ended their lives in gigantic celestial explosions called supernova type 1a, having shed most of the outer layers and ending in a ball the size of a small city. These strange objects are made up mostly of neutrons, and these bodies possess incredible properties. For example they are intensely magnetic and extremely dense and have incredible gravitational pull. But the observation that I am most impressed with is the rapidity with which these bodies spin on their axes. Some of them spin up to 600 times a second! Imagine one of our cities spinning hundreds of times a second! Astronomers have noticed this property as well and offer a dismissive explanation like: "It is similar to an ice-skater bringing the arms in so that the spin picks up speed". I couldn't disagree more! I think this fantastic rapidity of spin exhibited by neutron stars clearly shows what happens in the nucleus of an atom: they also probably spin at such rapid rates, underlining the fundamental nature of this property. 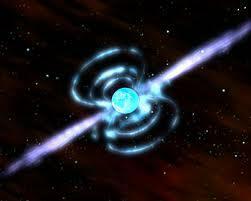 The neutron star behaves like a gigantic nucleus, without the hindrance of electrons and in the vacuum and almost zero gravity of space, they are able to spin uncontrollably. This rapid rotation of the neutron star on its axis is, I propose, responsible for the intense magnetism and gravity displayed by it. I also propose that, from the size of the neutron star and the rapidity of its rotation, one could calculate the degree of magnetism and gravity displayed by it. Of course, electrons and even neutrinos have been observed to spin, again highlighting the ubiquitous nature of spin. In summary, the universe can be considered to operate at both the micro and macro levels, and while there is a continuum of goings on at the very small and the very large, for the sake of description, I separate these two extremes. Quantum mechanics operate at the subatomic level and largely delve into the chaotic behavior of subatomic matter; the strong and weak nuclear forces and electromagnetism find special place in the sphere of the atoms, while gravity and spin come into play in imparting order at the very large scale, the planets, stars and galaxies. In the sphere of the very large, gravity and spin are equally important and they work in tandem. Finally, I contend that the spin of matter does not end with the galaxies, the huge structures such as they are, but the whole universe itself displays it. I find it illogical to think that it is otherwise. Here, what I am proposing is that all the matter in the universe, both seen (stars, planets, their satellites and the myriad lesser bodies that orbit the stars and, the galaxies themselves) and unseen (the ubiquitous dark matter, that makes up at least 90% of the mass of the universe) are spinning in one direction around the central axis of the universe.